Ever since I moved into my new condo, my living room has taken the backseat to other areas of my condo (I'm looking at you, beauty room)! It's been ignored for weeks and now it is time to fully put it together. The days of the cardboard coffee table are coming to an end, and I can't wait to have my living room cute and fully functional. I've been looking at online decor blogs to get inspiration, and I've decided to mix my modern condo with my love for shabby chic. I am aware that this can go very wrong if done improperly, but I don't want to go completely modern (not my style), or completely shabby (will clash with the condo) so I need to meet somewhere in the middle. My sofa: Gorgeous and super comfortable. It looks like it would be more of a "pretty but not cozy" sofa, but this thing is super plush and insanely comfortable. Plus, it's so easy to clean! I am absolutely loving this, and have 2 of them. Ikea Lamp: I've seen this lamp on various decor blogs and love it! See here and here for examples. Ikea Bar Stools: I've been looking for ages for bar stools that are actually comfortable and can't find anything else, so these are the ones I've decided on. I wanted soft ones that have a bar and a place for your feet, and I sat on these in a local Ikea and they are comfortable enough to pass my test! CB2 Chill Media Console: Brings a dash of modern back in the room with it's glossy paint and because it's very low to the ground. I will have my TV sit on this for now. Eventually I might get something custom built for this space, but for now I want something that works with the rest of the room. I would think that this might clash with the cream sofa and the wooden coffee table, but I found a blogger who has this along with a light sofa and wooden kitchen table and it looks beautiful all together! Gold (and silver) accents: I love metallic accents in neutral rooms. Colorful accessories, like coffee table books, flowers, and pillows: Might as well go colorful with the accessories since the rest of the room is super neutral! The only thing I haven't figured out yet is my coffee table. There are so many options that I like and that can give this room a slightly different feel, so I thought making a collage and seeing them in addition to the other pieces would be a good way to figure out what I want. 1) Ikea Lack Side Table. I saw a really cool picture where someone had taken two of these little guys and put them side by side for a coffee table. I thought it looked so cool. 2) Ikea Klubbo Coffee Table. A little more modern than the first option since it has the metal edge. 4) West Elm Box Frame Coffee Table. Another option that I really like. 5) Ikea Lack Coffee Table. Just another idea, instead of doing 2 of the Lack Side Tables. The sofa I have, so you can see what it looks like with a coffee table like this in front of it. The Ikea Lack Side Table, put side by side as a coffee table. Picture-wise this is my favorite, but remember my sofa is a light cream, not dark like this one. So... I need your opinion. Which option (of these) is your favorite, considering what other pieces I have or am going to get (shown in the top picture)? I'm getting to that point where I am just going to close my eyes and point at one to pick it if I can't make a decision soon - my living room needs some love, ASAP! Leave me a comment with what you think would look best - I would love you forever! My favorite is #4 because I love how the dark beams go all the way to the bottom so there are no "legs" of the coffee table underneath it. Make sense? I also like the contrast between the light wood of the actual surface and the dark beams. I think it really meshes together shabby chic (light wood) with modern (dark metal) well. #2! It would look so good with white/metallic decorations and colourful books on top. I think the two ikea lack side tables put together would look really cute and different (giving it a modern feel yet still shabby chic)! #3 The Ballard Designs Durham Cocktail Table. The darker colored wood gives contrast to the light colored furniture in the room. It will easily blend with colorful and metallic accents. And will draw attention to it because of the difference in color making it more of a focal point in the room. I currently have the IKEA Lack series furniture in my living room (coffee table, side tables, tv stand in a dark color) and they've worn quite poorly over time. There are scratches and chunks taken out of the finish by simply moving a small light weight lamp when cleaning. I can only imagine that the white finish would show signs of wear much easier. I 100% agree. #3 without a doubt. You have such a great sense of style. I love that you like Shabby Chic. I also like your sofa. I think a coffee table with two layers looks the best. I'm not sure which one. 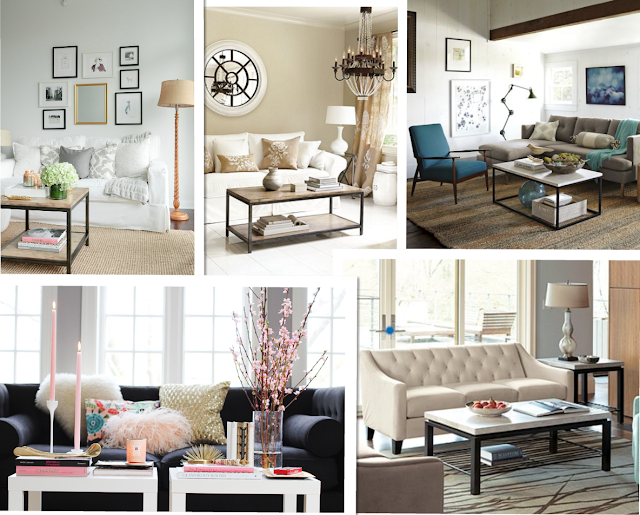 love #s 3 and 4 for the coffee table choices. I think both have the metal which as you said is a great accent color and breaks up the room from being all white. However, they obviously give off very different vibes. #4 is sleek and makes the living room feel fashionable and formal. #4 is more comfortable and makes the living room feel laid-back, Californian (because the top looks like driftwood found in the ocean), but still put-together and coordinated. If it were up to me, I'd choose #3 because it's for your home, not an office. However, bear in mind that if you choose #3 you definitely need to have a couple of natural elements in the room (maybe a leafy tree in a silver/metallic pot, small accent pieces that you can buy at craft stores (for example, look at the Michael's website under Home Decor and Ashland Collection). hope i helped! good luck! I love the different Lack tables, the #1 and #5. The seem the right end of modern and shabby at the same time, especially the first one. Can't wait to see how it all comes together. I personally like number four the best. # 2 is the best in my opinion. I really love the metallic part of it as it adds contrast to your room. I like the fact that the table is lower and I could def. see you putting all your books and items on top of it! Good luck with your choice! Elle, do you have a West Elm in your area? This could look cute with your sofa - it's kind of like the Lack table but a bit more shabby. I really like #2 thw Ikea Klubbo... But then again, I just purchased it. It's a nice and clean design, not too modern that can adapt to any room in my opinion. I think it would look beautiful with your couch and also makes a nice match with your bar stools and kitchen. 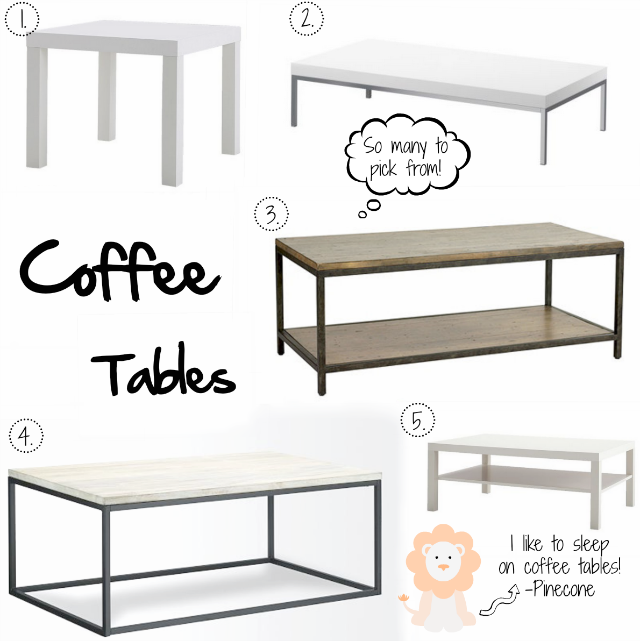 I like #4 or #5 the best for the coffee tables! p.s. I love that IKEA lamp! I've had my eye on it for a while :) and I think Fleaur de force has the same model in her office! I really like #2 beacause I think the metallic would look good with your other furniture but I also love #5 because its classy and I think would look really good with everything else! I also like the idea of the wooden coffee table I think it would spice up the room and make it feel and look different but in a super cute way! I love #2 and #5! I like how they are both white and both lower to the ground (which I really dislike about #1). I also love the shelf under #5 (super convenient). Good luck with the coffee table! Ballard Designs Durham Cocktail Table is my favourite! I think its colour goes so well with cream/white sofa! It makes it so girly and sophisticated! I like coffee table number 2! I really love the way the two Lack side tables look together, but if Pinecone is anything like my cats (and I'm assuming he is since you like to call him the tyrant), then there won't be much room for him to hang out on them and that means all of you beautiful decorations will end up on the floor. The Klubbo will give you the same effect while also giving Pinecone room to relax, saving your interior design in the process! I'm completely in love with your sofa! Good thing it's super easy to clean since I'm sure Pinecone sheds a ton...haha! I really like #3. I think it'll give the room a bit of a break since the couch and the media stand are both white. Also really digging the 2 tables put together. I love #5 just because I feel it would work amazing with your other interior and especially the sofa! I like picture 4 and if you can get table 5 in a similar colour I think it'll look gorgeous! Oh, think about getting it matching to the legs of your bar stool? I prefer number 2. I think it looks more modern girly chic! I like the Ballard Designs Durham Cocktail Table! It goes perfectly with both the sofa and the media console. Can't wait to see the room when it's all finished and lovely. As a former employee of Ballard Designs (corporate office), I'd say you have to go with the Ballard table! They put so much effort into every detail in the furniture making and designing process. I have seen this table in person and is a very elegant and understated piece. You and Pinecone will love it! I think the 2 is the prettiest (of the coffee table options)! Good luck and it is going to look gorgeous because you have great taste elle! As someone who will hopefully soon decorate my own place, I would really love to read a 'how to decorate' kind of post? Maybe things to think about when deciding on furniture etc? It seems you may have some good insights, and I would like to do things right at the beginning, not through trial and error. I like #4 and #5. I also like the 5th room picture. I think 3 is little too dark and 2 looks really short. but maybe that's just the picture. Hi Elle! I love your choices of decor of living room. I think #3 will look good, as it got metallic and wood which is great combination. Plus you you can put books and magazines underneath, which leaves space on top to put anything you want and it will be firm due to metal. Hi! I would say two tables of #1 as you said. I think they will look fun and modern because there will be two of them, yet have a 'traditional' feel to them because of the simple white wood. Bonus: they can be easily moved around during parties and events and if you end up not liking them, you can repurpose them as corner tables ect. My boyfriend and I just moved into a new apartment and finally put our coffee table together a few days ago! Our walls are painted "driftwood grey" and we have a greywood coffee table from ikea. We liked the idea of a neurtral pallet to have some items that are colorful stick out, and the art on our walls stick out as well. I think #4 is my favorite! I think it will fit your shabby/modern mash-up perfectly. The others are all so simple that I think it will make the room lean too far towards modern. I think number 4 if you're having a rug under it, 3 if you're not. The lighter top compliments the other neutral furniture in the room, but the darker legs will go well with the bar stools you've chosen. It's very shabby-chic-esque too. The coffee table is central so you want it to tie everything else together. Either 2 or 4. I like the white top with the darker legs. The table in that collage picture showing your couches is a really good choice as well in my opinion. I have both the lack coffee table and side table in an expresso colour. I love them and say go with them if you just want to keep it clean and crisp, but I like #3 for your room. Inserting the wood into your cream/white and metallics, gives a wonderful texture change, especially if you are going shabby chic as you said. I like the wooden coffee table from West Elm. It will create a visual break from the whites and bring warmth to the room! I really like #2 & #4, they look really sophisticated! Love the new blogs..you need a sense of warmness with the wood to balance your otherwise cold ( white) living room. Definitely #4...plus I have been eyeing that table myself. Gotta love West Elm. Definitely 4. Those tables look so chic in any room, and it is a strong modern contrast to your whimsical sofa. i like tables 3 and 5. They look special and the ones with shelves add function. My favourite room pic is the one with a pop of teal!!!! I like the soft pink in the second last photo, but the white on black pattern gets really old on me, and comes off as cheap sometimes. I really like the combination! I like the 2 square tables side by side, very modern yet edgy and feminine, but yes, it is a lot of white since the sofa is white. I think that would still work. The second favorite is the West Elm one in Living room picture 5, the contrast against the light sofa would be pretty, and I like the shelf underneath it. How big is your bedroom closet? I'm buying a house (yay me haha), and your closet from your video seems like it's around the same size as mine. I wanted do a closet storage system but I have no idea what the layout will be. I'm thinking of going with the ikea closet systems. i'm so indecisive! I hope you see this because I figured me trying to write it on your video would get lost in the comments. I love the fourth coffee table (box frame), it has both black and white which fits your condo colour perfectly! Also love the idea of the two side tables put together, however I think it would be less practical. I know I would get annoyed of having the gap between the two tables eventually. #3...its cuter, plus the bottom "shelve" gives it more storage/decor room! i really like the look of number 4, if number 1 does not come in black. I will have having a $100 target giftcard giveaway once I get my first 50 followers. 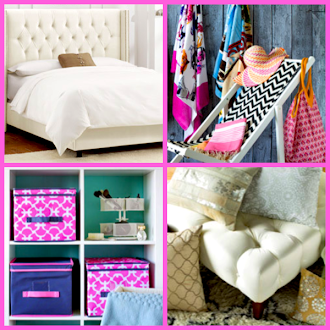 I will be posting 5 days a week all about beauty, fashion, decorating, and organizing! I think 3 and 5 would be good as they have the extra storage space below, which could come in useful, and would look neater than just putting things on the floor beneath the coffee table. Persoanlly I prefer 5, as I think white/cream will work better with the table as it is such a central part of a living room, and then you can add different colours and textures with pieces that are slightly less central. I think number 5 is the best and would suit your living room very well. The living room looks so bright and welcoming. 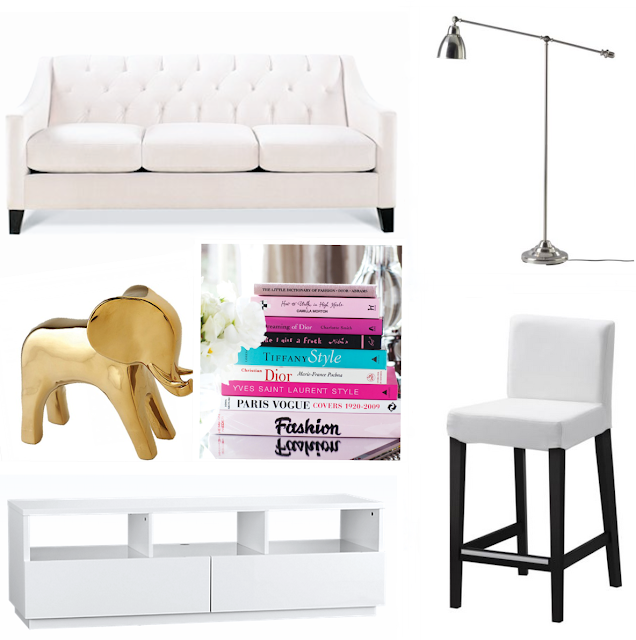 I love white furniture as it makes the room look larger. I also have lots of indoor plants which will perfectly combine with white/cream colours. 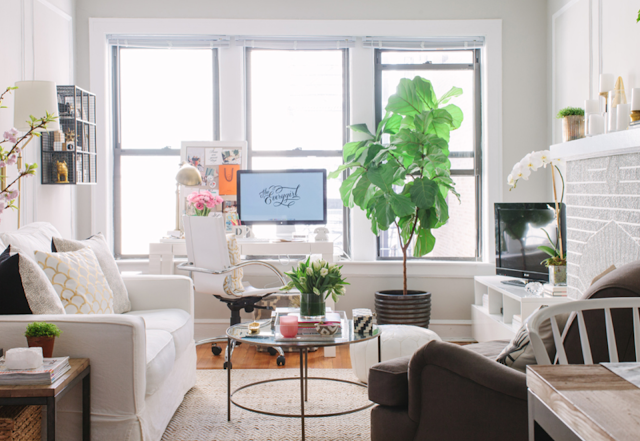 Hi Elle I absolutely loveeeee all of your home decor! its classy and and just right!! you have amazing taste and really transformed the place and made it look like a dream home :) I have been looking at your old posts to try and find out where you had gotten the beautiful Paris painting that you always have in your makeup videos but couldnt find anything about it! its exactly what I am looking for! So if you get a chance I would luv to know where its from! thanks in advance!